Fifty years after a catastrophic blowout, an underground natural-gas reservoir in the Netherlands is still leaking methane into the local drinking-water aquifer, a new study finds. There’s no evidence of the methane leak above ground, but water drawn from some wells adjacent to the blowout site has enough methane in it to merit immediate action to prevent explosions, a team of Dutch geologists found. Methane dissolved in water isn’t known to be toxic when drunk, but if enough methane seeps from someone’s well or tap, it can asphyxiate people or—given a spark—explode. The new study adds another scenario for regulators and citizens to consider: If a well has suffered a blowout, it may damage the reservoir in such a way that it continues to leak gases for decades. 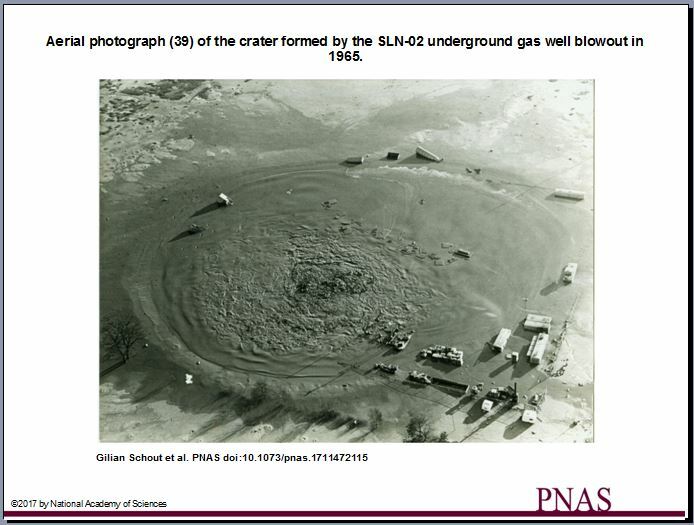 That’s exactly what a team of Dutch geologists found when they analyzed water wells around the site of a dramatic natural-gas well failure near the village of Sleen, in 1965. While workers were drilling a new well, it created unexpectedly high pressure underground. Several geysers of gas erupted around the field, which eventually coalesced into a 1,100-foot-wide crater that swallowed the drilling rig. Workers were not able to stop the leaks until more than two months later. After the blowout, the local water company drilled several wells around the disaster site so that it could monitor the groundwater quality. The Dutch geologists took samples from these monitoring wells and analyzed them for methane, looking for chemical signatures that suggest where the methane came from: either the natural-gas reservoir, or from microbes that make methane when they decompose organic matter. Dutch groundwater sometimes has very high levels of methane naturally, the geologists write in their paper, so finding methane alone doesn’t mean the gas reservoir is at fault. But the scientists found high levels of reservoir-derived methane immediately around the blowout site, suggesting the reservoir is still leaking. Some of the concentrations they found were enough to merit immediate action, according to recommendations in a 2001 Department of the Interior report. Meanwhile, on the surface of the ground above the reservoir, there’s no evidence of any methane leaks, the Dutch geologists note. Blowouts present a small but genuine risk when drilling into the deep subsurface and can have an immediate and significant impact on the surrounding environment. Nevertheless, studies that document their long-term impact are scarce. In 1965, a catastrophic underground blowout occurred during the drilling of a gas well in The Netherlands, which led to the uncontrolled release of large amounts of natural gas from the reservoir to the surface. In this study, the remaining impact on methane chemistry in the overlying aquifers was investigated. Methane concentrations higher than 10 mg/L (n = 12) were all found to have δ13C-CH4 values larger than −30‰, typical of a thermogenic origin. Both δ13C-CH4 and δD-CH4 correspond to the isotopic composition of the gas reservoir. Based on analysis of local groundwater flow conditions, this methane is not a remnant but most likely the result of ongoing leakage from the reservoir as a result of the blowout. Progressive enrichment of both δ13C-CH4 and δD-CH4 is observed with increasing distance and decreasing methane concentrations. The calculated isotopic fractionation factors of eC = 3 and eD = 54 suggest anaerobic methane oxidation is partly responsible for the observed decrease in concentrations. Elevated dissolved iron and manganese concentrations at the fringe of the methane plume show that oxidation is primarily mediated by the reduction of iron and manganese oxides. Combined, the data reveal the long-term impact that underground gas well blowouts may have on groundwater chemistry, as well as the important role of anaerobic oxidation in controlling the fate of dissolved methane.